Paintball is a thrilling pastime, an athletically demanding team-oriented sport, and a complex tech-oriented hobby all at once. This is why it has become popular among young and old, newbies and pros alike. 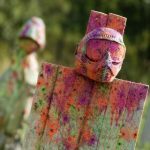 The paintball guns themselves are endlessly customizable and modifiable, with an entire cottage industry devoted to the development of ever more complex and technologically advanced models. As this market can be somewhat daunting for outsiders to parse, we've taken a look at several similar models - some from competing manufacturers - and compared their pros, cons, and feature sets at various price ranges, with a specific focus on the Tippmann Cronus. What Is the Tippmann Cronus? 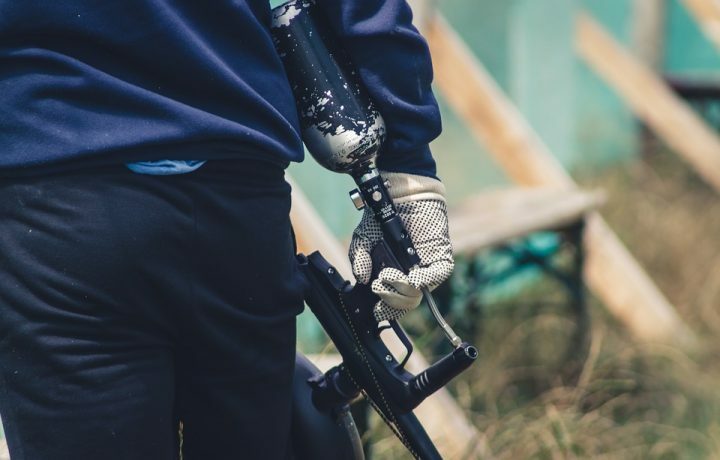 The Tippmann Cronus is paintball gun designed with an eye towards competitive play and usage whilst retaining the user-friendliness and accessibility one might expect of an entry-level, mid-price sporting good. It can accommodate long periods of use, modifications or accessories, and rough handling with high amounts of convenience and comfort. The Tippmann Cronus features a vertical grip for both stability and comfort as well as an in-line bolt design for time-proven durability. It possesses both front and rear fixed sights to allow the user to hit targets accurately even at a distance. Its high-impact composite body can take a hit, making it perfect for use under any environmental circumstances. It has an internal gas line, protecting sensitive components and further streamlining the design of the unit. For the purposes of modification and customization, multiple picatinny rails are incorporated, opening the model up to make easy use of the optionally available modification kit offered by the manufacturer. The barrel used is a high-performance ported barrel model and the color scheme of the unit is black and tan. The Tippmann Cronus clocks in at .68 caliber, and sports an open bolt blowback valve system loading action. For air supply, the unit works with compressed air, nitrogen, or CO2, with a gravity-based paintball feed and semi-automatic mechanical trigger. This model's barrel length is 9.5", with the total length of the model measuring 27.5" with stock collapsed, and 31.5" without. The effective range of the Tippmann Cronus is 150+ feet, with adjustable velocity. The weight of the unit excluding air supply cylinder is 3.7lbs. 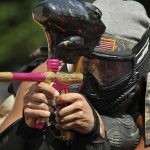 The models of paintball guns explored on this list range in price from $100-$325, with an increase in price coinciding with expanded modification functionality, durability and quality of build materials used, as well as viability for competitive play. We picked a few similar models of paintball gun available on the market to see how they compare at both mid-range and higher end price points with regards to their accuracy, range, and general design quality, as well as the warranty coverage offered by the manufacturer. 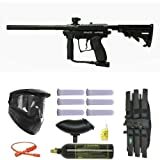 The Tippmann Cronus can be purchased wherever sporting goods are available at a price point of $$-$$ as well as from the manufacturer's website and other online marketplaces such as Amazon. 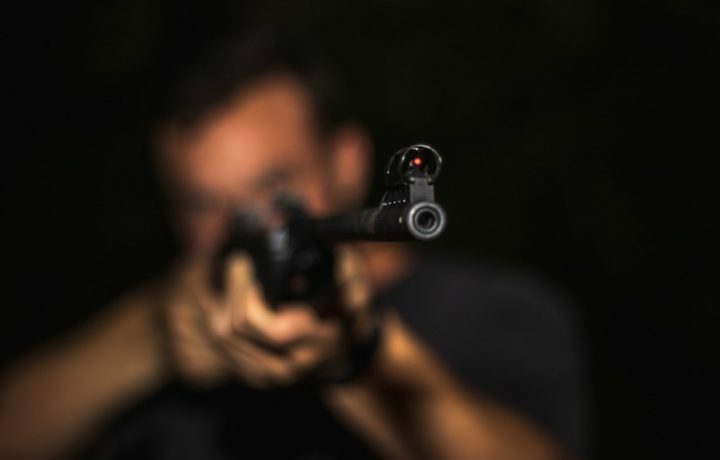 The Tippmann Cronus features front and rear fixed sights, allowing for accuracy with a skilled hand even at a distance. With a 150+ effective range, the Tippmann Cronus benefits even further from adjustable velocity settings allowing for the appropriate amount of oomph behind every shot no matter the distance. The inclusion of picatinny rails for further modification into the Tippmann Cronus's design is a serious bonus, along with the high quality of the in-line bolt barrel design, as well as the inclusion of soft grips for comfort and control. The Tippman Cronus is covered by the manufacturer for one year following the date of original purchase, including free repairs for defects in materials or workmanship. All further accessories are covered for 90 days following the date of initial purchase. This mid-range model from the same manufacturer as the paintball gun above features a less specific and more highly customizable design, with a feature set that makes it an excellent choice for use out in the woods or far away from home. It makes use of a Cyclone Feed system, which loads and fires 15 paintballs per second without the need for any type of external energy source. On the outside, the model is ergonomically designed with a long front grip, lighter than average body weight, and easy to remove push pins for the sake of field stripping in under 60 seconds without tools. This makes it ideal for a scenario that requires quick decision making. There is a two-position selector switch, which allows the user to toggle between safety and firing modes quickly. This model is a .68 caliber paintball gun, with a semi-automatic open bolt blow backloading action, which makes use of either compressed air, nitrogen, or CO2 as an air supply. Its total hopper capacity is 200 paintballs. The barrel length is 8.5", with the total length of the unit measuring 20". The total effective range of the unit is 150+ feet, with a cycle rate adjustable from 8 to 15 paintballs per second and adjustable velocity. The weight of the unit without air cylinder is 3.23lbs. This model can be purchased wherever sporting goods are available at a price point of $$$-$$$, as well as from the manufacturer's website and other online marketplaces such as Amazon. This model focuses less on accuracy than firing rate, and although its certainly serviceable, the lack of a scope nonetheless changes the functionality of the unit. 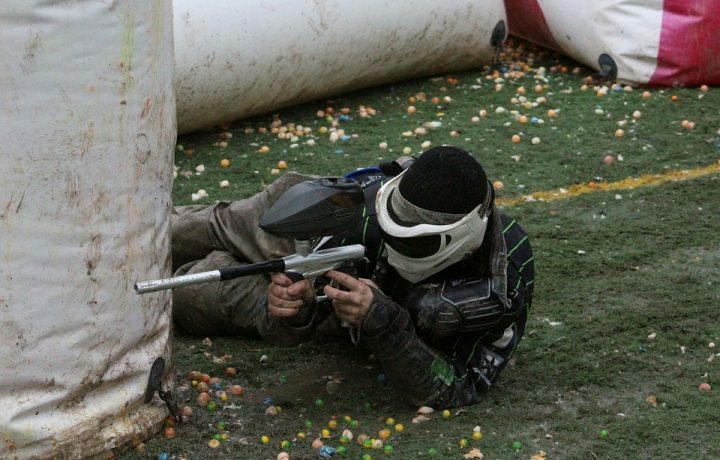 The rate of fire is adjustable, however, which grants some control over the spread of the paintballs being fired. With a 150+ effective range, this model benefits even further from adjustable velocity settings allowing for the appropriate amount of oomph behind every shot no matter the distance. This model's refocused design ethos highlights a large amount of customizability and versatility, with the unit capable of being deconstructed in the field in a matter of moments. However, the lack of a collapsible stock and the presence of an external air line makes it slightly less portable than other models. This model is covered by the manufacturer for two years following the date of original purchase, including free repairs for defects in materials or workmanship. All further accessories are covered for 90 days following the date of initial purchase. This higher-end model incorporates a top-of-the-line feature set making use of precision-machined components and electronically advanced circuitry, as well as various features designed for the convenience and ease of the user. This model makes use of a DYE UL Hourglass 45 frame, which incorporates sticky grips and an adjustable aluminum trigger. The body of the unit is designed to easily unscrew apart, and it features conveniences such as a self-cleaning M2 eye pipe with color-coded O-rings to expedite the maintenance process. All of these components work together to prevent miss feeds and double-feeding in a sleeker and easier to maneuver design. This model is a .68 caliber paintball gun, with spool valve operation at a pressure of 155psi, making use of HPA as an air source. It has an external hose. An autococker barrel thread is incorporated, with a total barrel length of 14" and a barrel bore size of .690 with a matrix style feed neck thread. The full length of the model is 17.5". The velocity of paintball firing is adjustable to up to 285 feet per second. Although there is a noticeable lack of an included scope, this model's precision engineered barrel ensures the clean and accurate firing of paintballs over long distances, with velocity adjustable via the unit's internal circuitry. Due to its high quality build and tolerance for high amounts of air pressure, this model sports a relatively advanced range of fire compared to the competition. The components incorporated are built for durability and self-regulation, keeping the maintenance required by the user to a minimum. Where it's required, color coding makes the process painless and easy to keep track of. This model is covered by the manufacturer for one year following the date of original purchase, including free repairs for defects in materials or workmanship. Electronic components are covered for six months. This model is an excellent option for those looking to upgrade from a less advanced model to something competition ready without sacrificing convenience and portability. It sports a valve system capable of shooting up to 1500 shots from a single 20oz CO2 tank, with a high impact polymer clamping feedneck. It makes use of a two-finger trigger for additional control over the firing process with an aluminum trigger frame, as well as a polymer M14-style vertical fore-grip. It features an external air hose line. 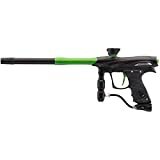 This model is a .68 caliber paintball gun, with a gas blowback operation and an operating pressure of 800 psi. It is capable of making use of either Co2 or HPS air sources, and can be deconstructed and reconstructed without the use of additional tools. The barrel length is 12", with a barrel bore size of .689 and a complete length of 26.5". This model can be purchased wherever sporting goods are available at a price point of $$-$$, as well as from the manufacturer's website and other online marketplaces such as Amazon. This model does not include a sight or method for consistent aiming, with a design focus oriented more towards simplistic and powerful operation. This model sports an 800psi operating pressure without adjustable shooting velocity, allowing for highly advanced range over the competition. The ability to take this model apart and put it back together without extra tools is a bonus although the exterior hose detracts from the cohesiveness of its overall design. This model is covered by the manufacturer for one year following the date of original purchase, including free repairs for defects in materials or workmanship. Electronic components are covered for six months, and the central circuit board for three months. 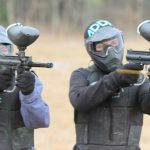 Paintball's accessibility has secured its position as both a common pastime and hobby, as well as an advanced and ever-developing athletic scene. 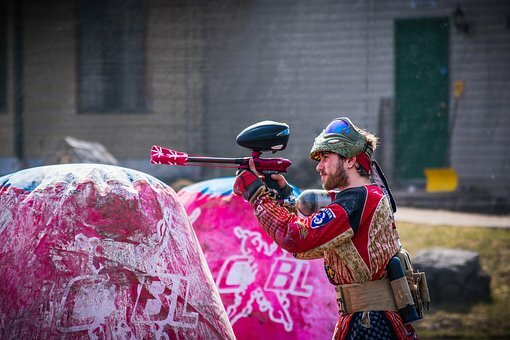 Although it's easy enough to get involved, it's important for you as the consumer to be sure that your purchase most effectively suits your intended way of play, whether that's customizing your paintball gun with the coolest accessories, or seeking out the complete package for the most effective competitive gameplay. Your preferred style of use should also be taken into consideration, with scopes and slower firing rates associated with careful aim and a patient shot, while high firing rates coincide with a slightly reduced accuracy but a more intense and perhaps more effective competitive edge. We hope that by examining the various aspects of these models more closely and comparing their pros, cons and different price ranges, we've made it easier than ever to choose the ideal paintball gun model for you.